There may be less movie panels at Comic-Con 2016 than in any recent year, but Warner Bros. is still bringing several of their upcoming blockbusters to Hall H tomorrow — that includes Wonder Woman, the highly-anticipated solo film starring Batman v Superman scene-stealer Gal Gadot. Ahead of her appearance in San Diego tomorrow, the actress has debuted a brand new poster for her solo movie, and it is beautiful. Power. Grace. Wisdom. Wonder. Yep, those are all the things we want and expect from a Wonder Woman movie. Even though Batman v Superman was a bit of a disappointment, Gadot’s small role as Diana Prince was more than compelling enough to get us excited for standalone adventure — made all the more notable by the fact that DC and WB are releasing a solo film featuring a female superhero before Marvel, who won’t be doing the same until 2018. Although WB hasn’t announced exactly what we’ll see during tomorrow’s Wonder Woman panel at Comic-Con, it’s safe to assume that the studio will release a full trailer or new footage of some kind, at least. We may also finally learn the exact nature of Chris Pine’s role; previous rumors suggest that he may be playing dual roles as both Steve Trevor and his grandfather, as the film takes place during the World War I era and present day. 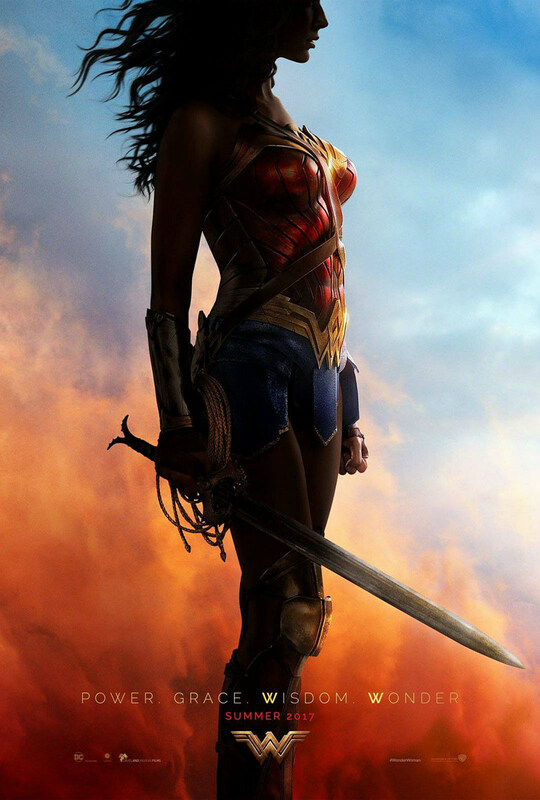 Wonder Woman is directed by Patty Jenkins and also stars Robin Wright, Danny Huston, Connie Nielsen, David Thewlis, Elena Anaya, Lucy Davis, Ewen Bremner, Said Taghmaoui and Lisa Loven Kongsli, and hits theaters on June 2, 2017.